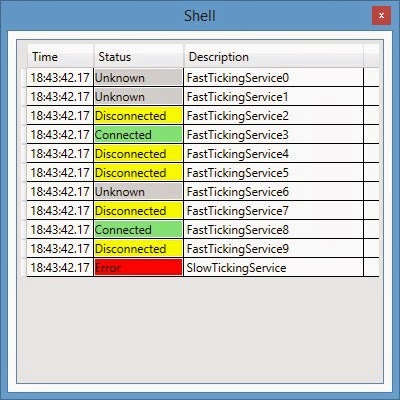 Working on a WPF application, I had a requirement to allow a user to monitor the status of a number of connected services – the status of some services could fluctuate many times per second. How would I get hold of these monitored ‘services’? Could I just create new instances and pass them into my monitoring class? Unfortunately not, as I didn’t know until runtime what these services were. How would I throttle the status updates to make them more presentable to the user without resulting in some sort of flashing Christmas tree effect? How would I unit test the monitoring behaviour? How would I display the status of specific items in an easy to understand manner? Did I want to wait for a disconnect status and show that in, say, red? Use the Managed Extensibility Framework (MEF) to discover, at runtime, a collection of lazily loaded classes which implement and export a specific interface (my IConnectable in this case). Use Reactive Extensions (RX) to throttle the frequency of updates in a more user friendly frequency - using the Sample() extension method. Use WPF Bindings and a Converter to format the appearance of individual items in a DataGrid. Extend INotifyPropertyChanged to include compiled properties for improved speed and change notification. Use NUnit and Reactive Testing’s TestScheduler to be able to move time forward to confirm that frequently updated status updates are indeed throttled back. PricingServices: collection of dummy “services” that implement my IConnectable interface. These all perform the same task of notifying when a connection status changes, albeit at differing times. This assembly is copied to an Extensions folder at compile time – the UI AppBootStrapper looks in that folder at runtime (see later section). ServiceDashboard.Core: core interfaces and abstract classes shared amongst projects. ServiceDashboard.Presentation: view model that react to changes in connection status (you could argue that these ought to be defined as Models). ServiceDashboard.UI: WPF application that displays the results from the ConnectablesStatusViewModel. ServiceDashboard.UnitTest: unit tests for the solution. Note: you’ll need to run “install-package Rx-PlatformServices” into Package Manager to include the RX PlatformService and related assemblies from NuGet. When the app starts, MEF will discover all classes decorated with the Export attribute and the IConnectable type (more on that later). The Status property is an observable so that we can listen changes in the connection status – it’s up to each concrete implementation to determine how and when the status actually changes (as you’d expect in a real system). Finally I’ll add IConnectablesStatusViewModel and IConnectableStatusItem. These are interfaces to that represent the view model - I don’t want any classes referencing concrete classes as we’re using Separated Interfaces throughout. We’ve got the core interfaces defined, now it’s time to use looks at MEF’s ImportMany attribute. This tells MEF to go off, at runtime, and find all objects that are marked with the [Export(typeof(T))] attribute. Note the use of the Lazy class – this provides support for Lazy initialisation – without it you’ll get a composition exception. Exactly how MEF determines which assemblies to go looking is very configurable – more on that later. Turning to ConnectablesStatusViewModel, this is the main view model responsible for listening to the list of IConnectable objects and converting those status changes into an observable list of items that we can bind to in WPF. When the constructor is called via MEF, I need to walk through each of the IConnectable instances passed in and listen for changes in each item’s Status property. To do this, I’ll create a subscription to the Status observable, adding the resulting IDisposable object to a CompositeDisposable instance (making it easy to dispose all subscriptions in one call). I loop through each of the connectable items (sorted for convenience by description), creating a ConnectableStatusItem item which takes the connectable’s Description as a constructor and then simply listen for a change in the connectable’s Status. Note, I’m using List<ConnectableStatusItem> rather than an ObservableCollection< ConnectableStatusItem> as the list of connectables will not change as the app runs (I’m getting them all right here, right now). So I’ve set up a subscription for each of the IConnectable instances discovered. I could now set my ViewModel as the DataContext of a WPF window, but if any of the IConnectable instances repeatedly update their status, I’ll end up with that annoying flashing Christmas tree look, which I’m trying to prevent. Ideally I want to buffer these updates to more usable number. I’ve decided to use a window of one second for updates, so if multiple status updates arrive within that interval then I’ll just take the latest update, if any, and present that. That’s it. Although, there is one big step that I need to do if I want this to be unit testable …more on that later. Gotcha: RX has a number of buffering-like extension methods, but you do need to be careful which one you choose based on the behaviour that you want. Throttle() sounds ideal for my use case, but Throttle ignores any updates that happen repeatedly within your interval period. I’ve created a ViewModel that, when given a list of IConnectable objects, will subscribe to status updates in each. The flip side of this is the way in which we tell MEF how to go about looking for assemblies. There are a number of ways to tell MEF how to do this, but one of my requirements was to use a plugins approach. When the app starts up it should look in a predefined folder for any “extensions” assemblies. To achieve this I need to use a DirectoryCatalog passing in the path that I’m interested – MEF will then look for any .DLL files (by default) and parse the types in each assembly. I’m going to use a simple implementation of the MefBootstrapper in conjunction with a basic Prism “shell”. I’m only using the Prism Shell as a convenient way to initialise MEF, and to load up a specific WPF Window are runtime. Normally you’d use a Shell with specific named regions, but that’s beyond the scope of this post. I won’t go into too much detail with MefBootstrapper (will leave that for another post) - just the key methods that I need override. Here we tell MEF where to find assembles that are resolved using the Import/Export attributes. I’m using AggregateCatalog.Catalogs.Add(new AssemblyCatalog(GetType().Assembly)) to include the current running WPF app (as it’s participating in part aggregation too). As mentioned above, my two of projects have a post-build event to copy build output to that folder. I’ve created a WPF Window called Shell (coming up shortly). This method will get called once MEF has been configured correctly. I’m using it to make Shell the active window. NB: I’ve commented out the common exception handlers that I usually attach to in a Release build. A splash screen .JPG resource is show using the Prism SpashScreen object (this is loaded prior to the time consuming WPF initialisation) and have guessed that it *might* take a second for MEF to finish and my Shell screen to be visible. At runtime, MEF will look for an item in its catalog which satisfies the IConnectablesStatusViewModel Import/Export. In this case it will be a shared concrete instance of ConnectablesStatusViewModel. The Setter will use that to set the Window’s DataContext – which the DataGrid is bound to. There’s a whole list of things that need to be unit tested, but for this demo I’ll just concentrate on the ConnectablesStatusViewModel. In this project I have ConnectablesStatusViewModelTests (in the Presentation folder). 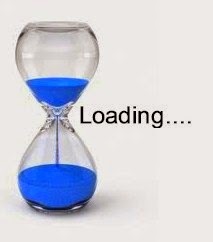 Because I’m using the Sample extension method, I’ll need to make some changes to ConnectablesStatusViewModel in order to gain control of time - remember that we’re buffering updates into time slices, so I’ll need to make use of an IScheduler instance from the RX concurrency namespace. In the unit tests I’m going to use a TestScheduler instance, in the real WPF application I’d use the DispatcherScheduler.Current instance as a scheduler. By doing this, I’m asking RX to use a specific Scheduler to run the sampling timer on. The TestScheduler allows me to move time forwards to confirm that I’m only getting a specific number of updates per interval. As I’m using MEF and an ImportingConstructor attribute I ideally need to expose a part that returns the DispatcherScheduler.Current for a named Scheduler export, for the time being I’ve created a constructor overload which is used by MEF and keep the second constructor which I’ll access via my unit tests. Back to the unit tests, I’ve added a new test with the interesting title MultipleConnectables_ConnectionsCountEqualsConnectablesCount. My test asserts that the count of connectables passed into the view model matches the count of the Connections property. CreateConnectable(): creates a fake connectable instance based on IConnectable using FakeItEasy’s A.Fake static method. CreateViewModel(): creates a concrete ConnectablesStatusViewModel instance with the specified List of connectables and the TestScheduler. Although I’m passing a TestScheduler, I’m not actually using that as part of this test. My next test is more interesting. I create a single Connectable instance, but use a Subject<ConnectionStatus> (statusSubject ) which allows me to explicitly fire status changes. The For loop represents many status updates firing. Remember that we have a rule which states multiple status updates should be buffered into once per second. Using the TestScheduler I can effectively wind the clock to represent a change in time, using the AdvanceBy method. So I wind the clock forward by half a second and assert that the status change event has not yet fired. Again I forward time by half a second, this gets us past our sampling interval, no matter how many status update have fired, and I’ve only received one property change. This is a great article on different software development blogs available. Whilst there is a lot of content, there are some awesome developers that are also worth. I'd also recommending keeping an eye on these Yiioverflow software developers for Nodejs, Angualr, Ionic, ReactJS and Yiiframework.